Born Ikemefuna Nwamonye, The artist called Klem is a native of Onitcha Ugbo in Delta State.The first son of a family of eight. He started his music career in Abuja with local band/group called 3pikals many years ago. His ability to create master pieces out of ordinary life situations as songs simply shows his song writing skill is indeed amazing. Klem who has also written songs and backed up for artistes such as Mumagee, Maheeda, Deji Falope (Malta Guinness Street Dance) & 2Sec. Also among the artistes he has worked with are Timaya on his hit track “Wat a Bambam” and Durella’s hit track “Inbox”. He was also involved in the One Naija theme song project alongside Mochedda, General Pype, Kel, Ifan, Ocean and many others. Among the countless number of artistes in Nigeria, Klem stands out in a most amazing way. This fast rising R&B pop star whose rhythmic vocal best speaks for him and shows he possesses a limitless arsenal of creating conceptual pop songs & ballads. His singing never fails to capture listeners, combined with his dexterity & profound lyricism which captures the hearts of lovers of good music. His hypnotic and energetic stage craft will take your breath away and leave you begging for more. He has many singles to his credit which he worked with popular producers and artistes such as General Pype, Cartier, J Slick, and American Super Star & Producer Ron Browz. 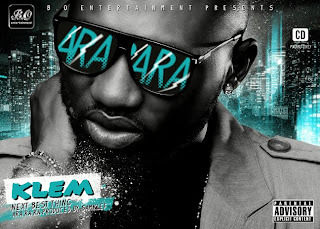 Klem’s new single “Ara ra ra” was produced by Samklef which he recently premiered it at the famous Opa Williams Day of a thousand laughs show in Port Harcourt and Calabar Carnival 2011. He is set to take the Nigerian and international music scene by storm. He is presently working on a Campus tour to begin later this year to precede his sophomore album dropping fall 2012 under B.O. Entertainment Imprint.